Buddhism is a house full of treasures — practices for gaining the happiness of future lives, the bliss of liberation and the supreme happiness of enlightenment — but knowing the difference between Dharma and non-Dharma practices is the key that opens the door to all those treasures. No matter how much we know about emptiness, the chakras or controlling our vital energy through kundalini yoga, it's all pointless without this crucial understanding of how to practice Dharma, how to correct our actions. 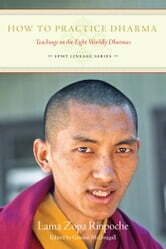 This book is drawn from Lama Zopa Rinpoche’s graduated path to enlightenment teachings given over a four-decade period starting from the early 1970s, and deals with the eight worldly dharmas which are essentially how craving desire and attachment cause us to create problems and suffering and how to abandon these negative minds in order to find perfect peace and happiness. The FPMT Lineage is a series of books of Lama Zopa Rinpoche’s teachings on the graduated path to enlightenment (lam-rim) drawn from his four decades of discourses on the topic based on his own textbook, The Wish-fulfilling Golden Sun, and several traditional lam-rim texts and in general arranged according to the outline of Liberation in the Palm of Your Hand. This series will be the most extensive contemporary lam-rim commentary available and comprises the essence of the FPMT’s education program. The FPMT Lineage Series is dedicated to the long life and perfect health of Lama Zopa Rinpoche, to his continuous teaching activity and to the fulfilment of all his holy wishes. The Lama Yeshe Wisdom Archive brings you the collected works of Lama Yeshe and Lama Zopa Rinpoche. The Archive was founded in 1996 by Lama Zopa Rinpoche, the Archive’s spiritual director, and works to offer the Dharma in as many ways as possible for the happiness and benefit of all beings. This book is made possible by kind supporters of the Archive who, like you, appreciate how we make these teachings freely available in so many ways, including in our website for instant reading, listening or downloading, and as printed, audio and ebooks. Our website offers immediate access to thousands of pages of teachings and hundreds of audio recordings by some of the greatest lamas of our time. Our photo gallery and our ever-popular books are also freely accessible there. Please help us increase our efforts to spread the Dharma for the happiness and benefit of all beings. You can find out more about becoming a supporter of the Archive and see all we have to offer by visiting our website. Thank you so much, and we hope you find joy by reading this book!